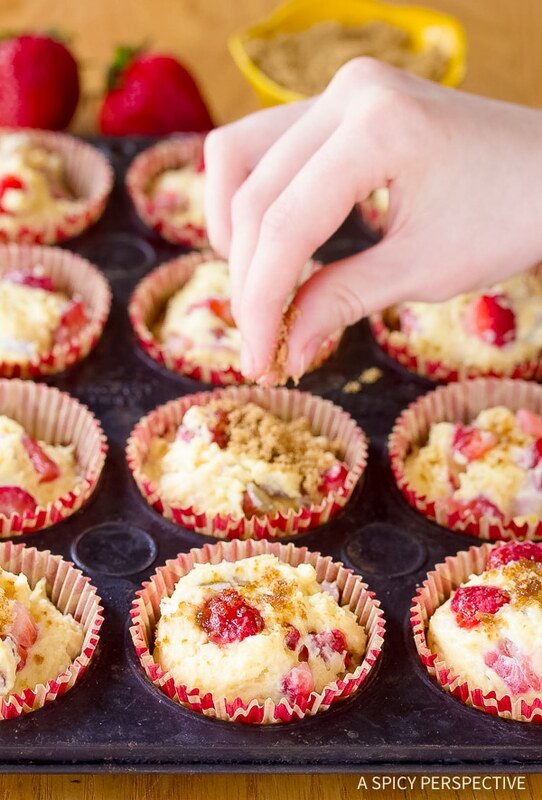 Before there were cupcakes, there were muffins… Strawberry Rhubarb Yogurt Muffins. Muffins are such an unassuming little snack. They pose as just about anything… breakfast, dessert, companion to coffee. Muffins will be whatever you want them to be, and will do it with grace. Popularity often dictates food culture, but don’t let the current trendiness of the modern cupcake tempt you to snub this sweet little treat. Don’t forget, in the late eighties and early nineties, muffins were all the rage. Muffins, as we know them, are a true American invention popping up in cookbooks in the early 1900s. Hearty and rustic, yet light and flavorful. They don’t need frosting, or any other ingredient to perfect them. Muffins have the substance to stand alone. I admit, this isn’t the most original flavor combination I’ve ever come up with, but it is definitely worth while. 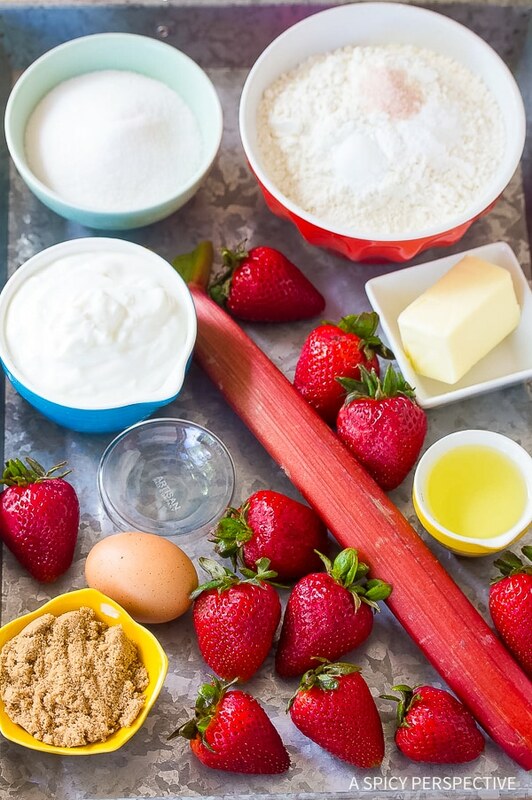 The classic duo of strawberry and rhubarb adds marvelous flavor to these light and creamy Strawberry Rhubarb Yogurt Muffins. Just look at the dome on these babies! Yogurt is one of my favorite baking ingredients because it provides a tart quality, like buttermilk, along with a moist, rich, creamy texture. A good muffin batter (in my opinion) should be thick enough of “hold” the berries and rhubarb in place, yet offer a moist tender crumb once baked. This particular Strawberry Rhubarb Yogurt Muffins recipe “takes the cake” and has become my favorite go-to recipe. 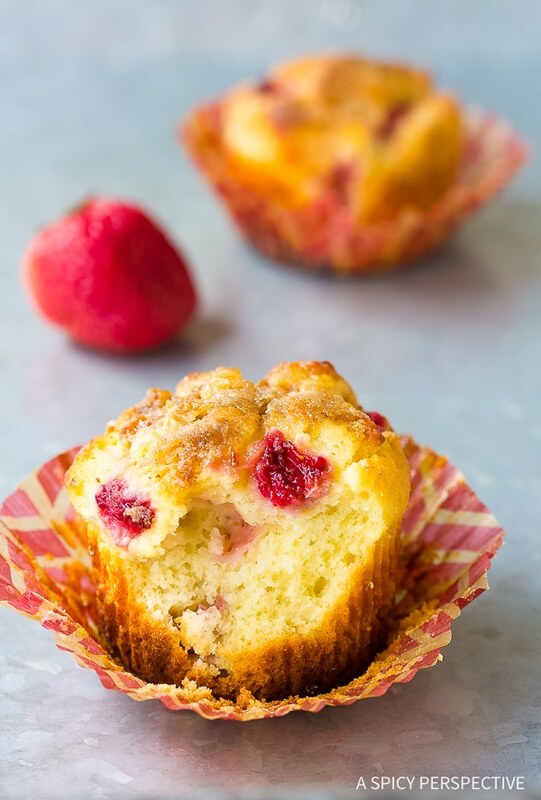 Strawberry Rhubarb Yogurt Muffins are so easy to make an eight-year-old can do it! 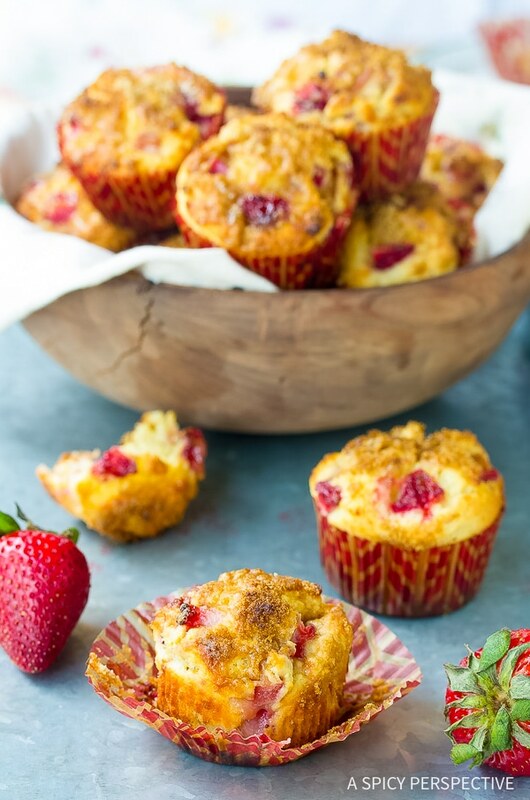 Strawberry Rhubarb Yogurt Muffins Recipe, a simple muffin recipe with tons of appeal! These might just be the best muffins you'll ever make... Moist, chunky, light and tangy. Preheat the oven to 450 degrees F. In the bowl of an electric mixer, cream together the butter, sugar, and oil until smooth. In a separate bowl, combine the first four dry ingredients. Add the egg, yogurt and almond extract to the sugar mixture and mix well. Slowly add the dry mixture into the wet mixture. 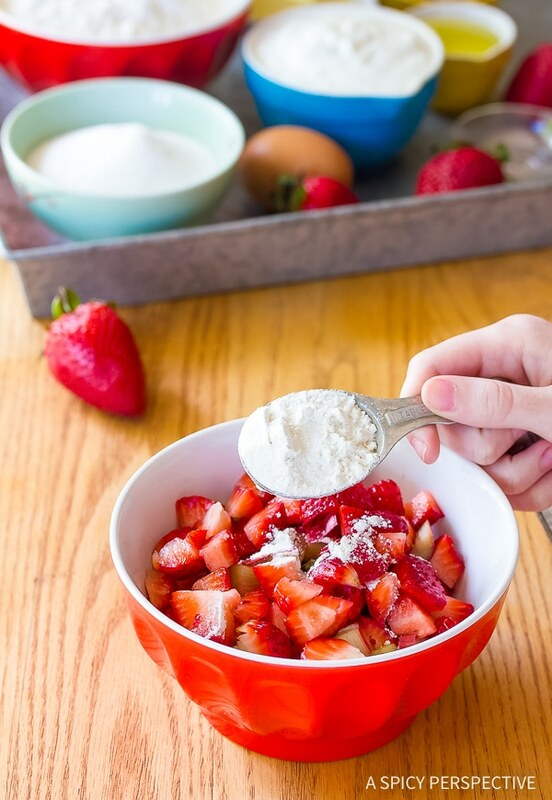 Toss the chopped rhubarb and strawberries with 1 tablespoon flour. Add the rhubarb and strawberries to the batter and lightly mix in. Place paper muffin liner in your muffin tins. Use a 1/4-cup scoop to fill the liners. Sprinkle a little brown sugar on the top of each muffin. Bake for 12-14 minutes until golden on top. NOTE: Some yogurts are thicker than others, making the batter dry. The batter should be thick, but if it's too thick (like dough instead of batter) mix in another 1/4 - 1/2 cup yogurt. Fantastic recipe. I’m just a single girl so I halved the recipe so I don’t have muffins going bad before thy get consumed. I did a couple of other modifications. I’m doing WW so I used the fat free plain Greek yogurt which worked fine. I also wanted there to be a bit of orange flavoring so I added some orange peel to the fruit mixture but then also subbed in some blood orange olive oil for half of the vegetable oil. I’m going to put this in my notebook of recipes to save and may try subbing in other fruit combos. Made these a few weekends ago and getting ready to make them again. I only had vanilla and strawberry yogurt and they came out amazing. Very moist and delicious. They didn’t last long at our house! I made these today, and they took longer than 12-14 mins (more like 20 mins. ); I also used frozen rhubarb and fresh strawberries, and the muffins burned on the bottom :( Still yummy. Hey Amanda, so sorry you had some issues with the muffins. It sounds to me like you may want to test out the temperature of your oven. I’d put a oven thermometer in it to check the general temperature. Then I’d move it around to different parts of the oven and see if you have hot spots. Seems 450 degrees is too hot an oven?? Just my opinion…I’m going to try making these but cut back on the temp and bake them longer…maybe 375? Made these for my family for dessert last night and my husband ate 4, this morning when I woke up (he had already gone to work) there were 3 more missing! He LOVES rhubarb! Made these today….all I can saw is YUMMMM!!! These are very yummy. I actually didnt have rhubard, but looked for a substitute for it. I was told a tart apple would work. And i had only coconut greek yogurt. These turned out awesome!!!!! too bad i burnt most of them though, i have to make another batch. Just made these almost exactly to the recipe. Only change was swapping vanilla extract instead of almond, only b/c I didn’t have any almond. AMAZING!! I might eat all of them right now. Oh yum. These muffins look amazingly moist, love the flavors too :D Can’t wait to try. Stumbled. Lovely recipe! I’m finally seeing a lot of rhubarb at the local markets (took long enough! ), and I’d love to try these. Nice idea of using yogurt, too. Muffins will always have my heart…I love the sound of these seasonal treats too. Strawberries are so good right now! 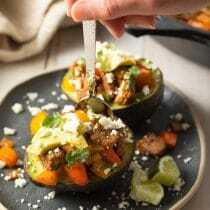 Thank you for sharing another inspired recipe. I hope you have a wonderful start to your week. Hugs and love from Austin! I’ll take a muffin over a cupcake any day. 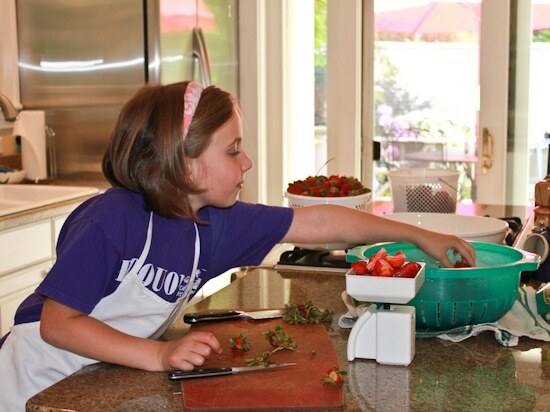 You little helper is adorable, neat to see the next generation of Top Chef’s in action! What wonderful moist delicious looking muffins. Cannot wait to give this a try. and strawberry and rhubarb is such a delicious combo. I love muffins, they are so much better than cupcakes, which are almost always too sweet. A muffin can be made to be a bit more healthy, too. Thanks for sharing this, I have actually never baked with rhubarb, but I have been wanting to- this looks like a good first try with it. I have never cooked with rhubarb before…love it when you make me branch out, Spicy! the muffins look oh, so tender and delish! I made the muffins today with fresh rhubarb from my garden. Delicious, with a very light texture and not too sweet. I guessed the oven temp. at 400F as I couldn’t see any temp. listed in the recipe. Could you confirm oven temp. 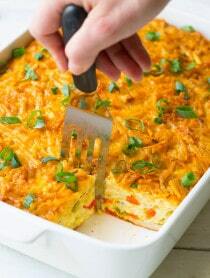 for this recipe please! I’m posting while on our family vacation–must have “vacation brain” right now. I baked at 450* for 12-14 minutes. These look beautiful, and delicious! I’m intrigued with the almond extract…I love almond extract, and rhubarb, but have never tried it together! I’m betting it’s fabulous! Thanks for giving me a laugh. I just recalled the last scene when Newman is brought in to “clean up” the muffin stumps. 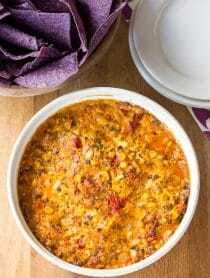 The recipe seems delicious, but those pictures are gorgeous! :) Love how muffins dome on top! Your daughter is even sweeteer than the strawberry! With four more stalks of rhubarb left,. can you see where I am going with this? What a great helper in the kitchen! Love the addition of yogurt in these. They look moist and delicious! I’m not a big cupcake fan. I am instead a muffin fan! I would totally forego a cupcake for a muffin. such a perfect treat. And strawberry and rhubarb….what a great combo! I usually don’t use rhubarb in my baking or cooking since the husband doesn’t prefer it (he also doesn’t like nuts or coconut–crazy man!) 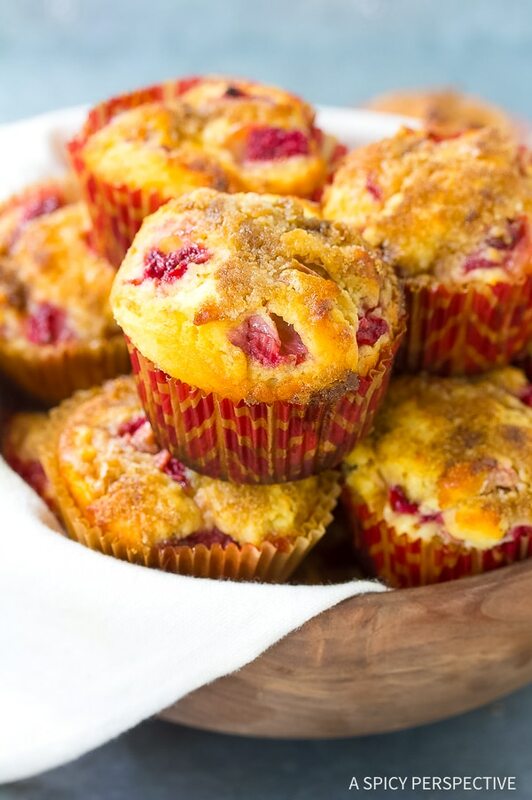 but these muffins are making me wish I had some rhubarb….then I could eat the whole yummy batch by myself! :) These look amazing! Gorgeous muffin. Wonderful job on these. Those muffins look so appealing and delectable! I have yet to try rhubarb – can you believe that? But this looks quite yummy! these muffins are so pretty! I love the yogurt in them as well. what a lovely baking tip. wonderful photos! I think muffins got a bad name because of over-processing to where they were an oil-filled, synthetic-tasting fluffy pillow the size of your head. Yuk! You have revived my faith in muffins. These look AMAZING and kinda HEALTHY, with two of my favourite summer flavours. Your young assistant is the cutest! wow- so summery & a delightful combo for the muffins !! Sommer, these strawberry rhubarb muffins look magnificent! Gorgeous photos too! These are gorgeous! You know I’m in love with the damask liners too! I’ve never been that big on cupcakes, give me a muffin any day. Especially when they contain my fave, rhubarb!!! Mmm these muffins look and sound fantastic. Great photos! I’m a sucker for cute cupcake liners–your black and white ones are adorable. What an adorable helper you have to make these delicious muffins! I love that you can see the berries. 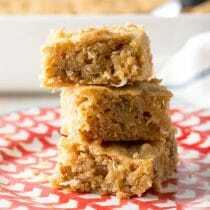 You mentioned that the batter is thick enough they didn’t sink – that is so awesome! I have had blueberry muffins with all the blue in the bottom. This is a lovely recipe. Do you think it would be just as good with strawberries only? Beautiful photos – I’m drooling! Your sous chef is gorgeous!! Your muffins look very inviting. I have never cooked with rhubarb. 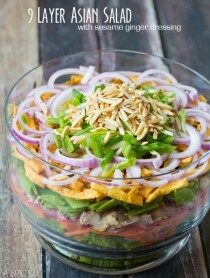 I am feeling very alone in that in the food blogosphere these days! Ohhh goodness..these are the perfect summer muffin!! Classics are a classic for a reason! They sounds heavenly. Those are gorgeous mufins! I’m a muffin top gal, breaking off the top and leaving the bottom! 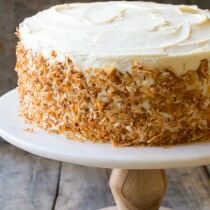 As you mentioned using yogurt instead of buttermilk, do you think yogurt could be substituted for buttermilk in recipes? Yum!! Looks so good! 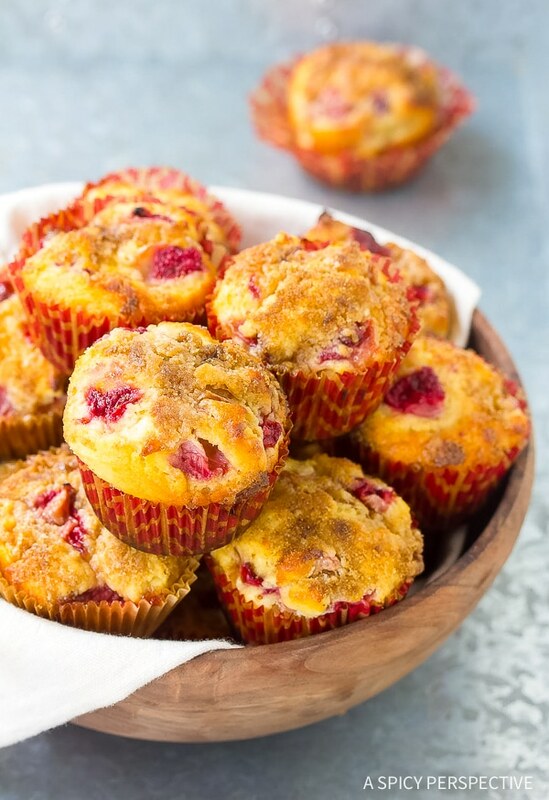 We love strawberry muffins for breakfast-I bet the addition of the rhubarb would make them even better! Thanks! These are perfectly moist! I see why she is reaching! I agree with you that a muffin recipe should have body enough to keep the additiona in their respective places within the muffin … this looks to be a good batter full of body! 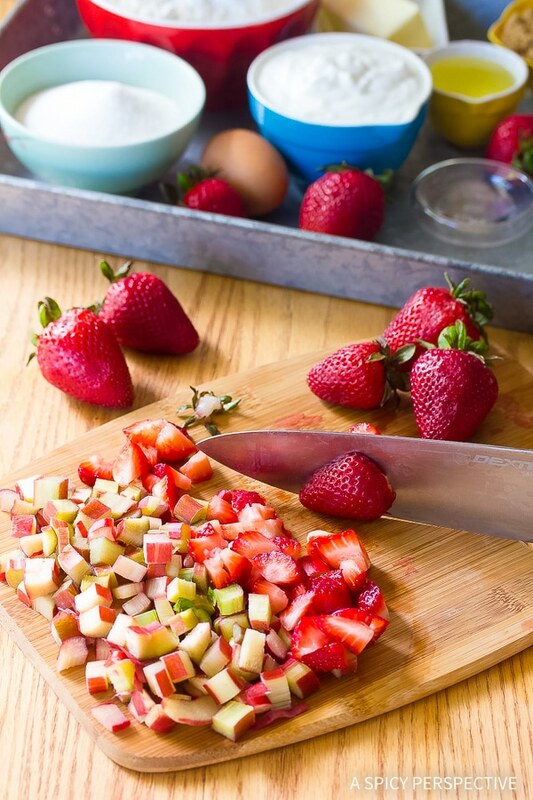 And why mess with a good thing when you have such a killer combo in strawberries and rhubarb? They look lovely! 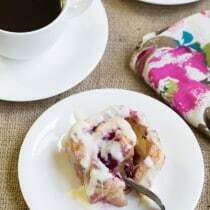 I especially love the photo of the berries and rhubarb behind the muffin on your picnic table! So rustic … and vivid! These look great! And I love your muffin liners, so cute! These are GREAT! IDK what’s cuter the little baker or the muffins?!?! I like the bit of history on the muffins. They’re the cutest invention ever and I’m loving this version with fresh strawberries so much!! Summer blisses! How I wish for that right now.